Liverpool's title bid is "ahead of schedule", the owner of the table-topping Premier League club has said. Three wins and a draw from their final four matches will secure Liverpool's first championship in 24 years. 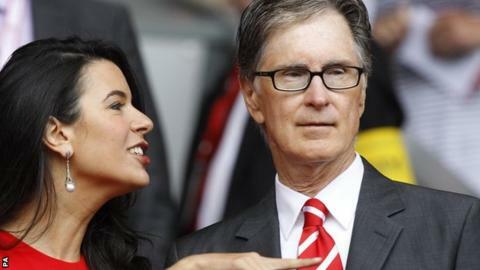 "We had our sights set on a top-four finish because we're building," American John W Henry told BBC Sport. "It's a challenge with the way the league is structured, so if we were fortunate enough to win this year, I would say we're ahead of schedule." "John W Henry, the Boston Red Sox owner, is rightly proud of his achievements, ending the once faltering franchise's long wait to win the World Series and helping them revive their former glories. "Under Henry there has been a sympathetic renovation of Boston's Fenway Park and he wants to do the same for Anfield. He hopes the Liverpool fans will like the designs which will be unveiled soon which really excite him." Henry completed his £300m takeover of Liverpool from fellow American Tom Hicks and US hedge fund Mill Financial in October 2010. In 2012, Henry appointed manager Brendan Rodgers, who has put them on course for their first title since 1990 having been given a target of reaching the top four this season. Asked if he dared to dream about the title, Henry admitted the challenge in restoring Liverpool's former glories was similar to the one facing them when they took over the Boston Red Sox baseball team in 2002 - and ended their 86-year wait for the World Series two years later. "We've been a part of something really incredibly special here [Boston] - we're beginning to feel we're apart of something really special there," he said. Henry said that, just like in Boston, when they decided to develop their historic Fenway Park Stadium rather than move to a newly-built ground, they are now following the same model with Anfield, after investigating the prospect of building a new ground in Liverpool. "The history (at Boston) is irreplaceable. It's the same at Anfield," he explained. "You've had European nights there and historic days that could never be replicated. People come from all over the world. "When (Liverpool chairman) Tom Werner and I were in Warsaw at a European Club Association meeting we were told by a number of executives from other clubs that the best experience they've ever had was at Anfield. "So, we're committed to doing whatever it takes to get Anfield to where it needs to be over the next 20, 30, 40, 50 years and its challenging but it's also rewarding and we'll get it done."